On Wednesday, Duke took on Kansas in the finals of the 2011 Maui Invitational in a high-profile matchup between two of the winningest programs in college basketball history. 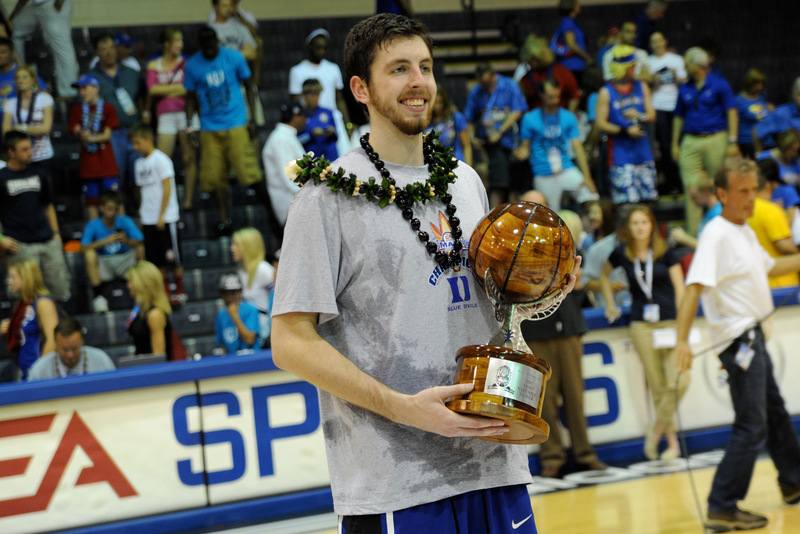 Tyler Thornton’s key threes at the end of the game gave Duke its 5th Maui title in as many tries and a perfect 15-0 record. Relive the magic in the Lahaina Civic Center Cameron West here. Shane Ryan discusses what has driven Duke teams throughout the years: guards. Focusing in on this year, he breaks down the play of Seth Curry, Austin Rivers, and Andre Dawkins thus far, including a detailed look at one play during the Michigan game in Maui. Be sure to check out this excellent piece by our good friend. Our rivals from 8 miles away fell this weekend to the UNLV Runnin’ Rebels in the finals of the Las Vegas Invitational 90 to 80. Though it was a virtual home game for UNLV, the top-ranked Tar Heels still entered the game as a 7 to 8 point favorite. It’s hard to tell what this game will mean for UNC looking forward, but it definitely will give Ol’ Roy a few things to work on in practice. Either way, looks like they won’t be holding onto that #1 ranking when the polls are released later today. Duke takes on Jared Sullinger and Ohio State this Tuesday in the Big Ten/ACC Challenge. This will be a meeting between two top 5 teams and another great test for the Blue Devils early on. Be on the lookout for more from us about this game, but for now, take a look at some of what the players have to say as Tuesday nears. 5. Well, the NBA Lockout Is (Tentatively) Over. Who Are the Winners? Losers? On Saturday, news broke that the owners and players have tentatively agreed to end the lockout and start a 66-game season Christmas Day 2011. Find out who benefited the most and who lost out. If you just want help understanding what exactly the details of the agreement are, Ken Berger breaks it all down here. Tommy Amaker has his Harvard Crimson off to a 6-0 start after knocking off Utah, FSU, and UCF to win the first ever Battle 4 Atlantis tournament. Johnny Dawkins was back in Madison Square Garden, leading Stanford into the finals of the NIT Tip-Off. Though Stanford suffered its first loss of the year in a close game to #5 Syracuse, both Harvard and Stanford showed potential and look poised for a great year. Best of luck to both coaches (and former Blue Devils)! Well, that’s it for this week’s Deviled Eggs. Be on the lookout for more from Crazie-Talk as the season progresses, and good luck to the team this Tuesday against Ohio State! Let’s Go Duke! ← Happy Thanksgiving, Duke Fans!